Our unique services are utilised by governments, conservationists, biologists, ecologists, developers, utility providers and wildlife organisations. Conservation Dogs provide a far less invasive, simpler, faster, highly efficient and cost effective method of searching. Please find below information on our great crested newt detection dogs and bat carcass detection dogs. Further information on Conservation Dogs can also be found here. WHY ARE GREAT CRESTED NEWTS AN ISSUE FOR DEVELOPERS? Great crested newts (GCN) are a protected species, and so their disturbance or destruction is illegal. GCN’s are protected under the Wildlife and Countryside Act 1981. In addition, great crested newts are also classified as European Protected Species (EPS) under The Conservation of Habitats and Species Regulations 2010. GCN’s on construction sites have to be trapped and relocated to ponds away from any building work. Clearing areas of protected and endangered species can be costly and time consuming. 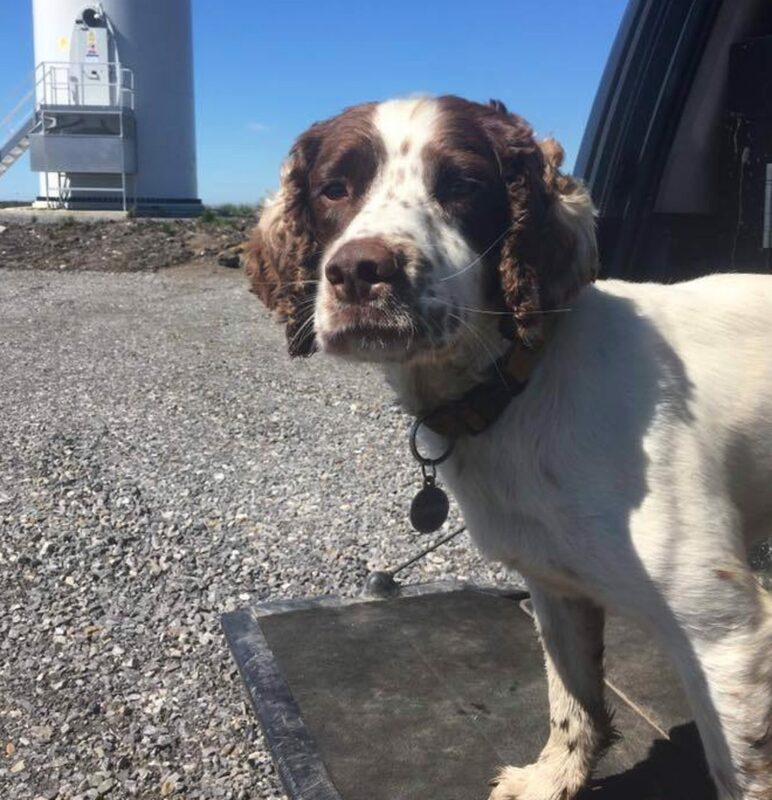 Working closely with the construction industry and ecologists, our specially trained detection dogs can make this process quicker, more efficient and more cost effective. A detection dog or sniffer dog is a dog that is trained to use its senses, mainly its sense of smell, to detect substances such as explosives, illegal drugs, illicit tobacco. Moveover, detection dogs can detect endangered species which have a low detection probability. For instance, great crested newts. A dogs sense of smell is two thousand times stronger, and fifty times more sensitive than that of a human’s. The training is based on a ‘reward system’. The dogs are carefully selected for their high drive and enthusiasm, sociability and ability to work in sometimes challenging areas. The training and work is fun for the dogs. We train them to detect a scent and they are rewarded with a tennis ball or their favourite toy. 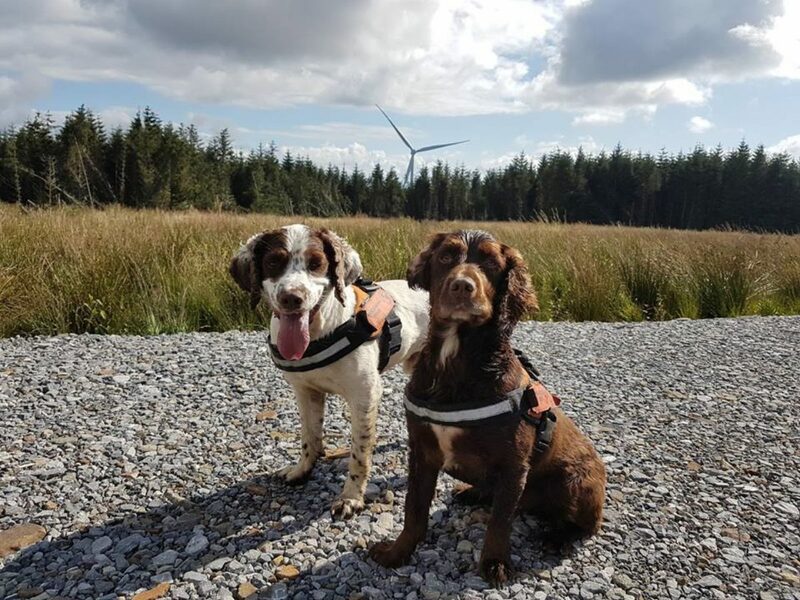 Our detection dog can assist construction companies and ecologists in the locating of GCN’s for removal whilst trapping out. In addition, the dog can identify areas where newts might be (i.e. rock piles/log piles etc.) that may have had to be hand searched. Thus speeding up the process of safe removal. Our dog can also be utilised to check areas post trap-out, to ensure no newts remain. WHAT ABOUT OTHER TYPES OF AMPHIBIANS? 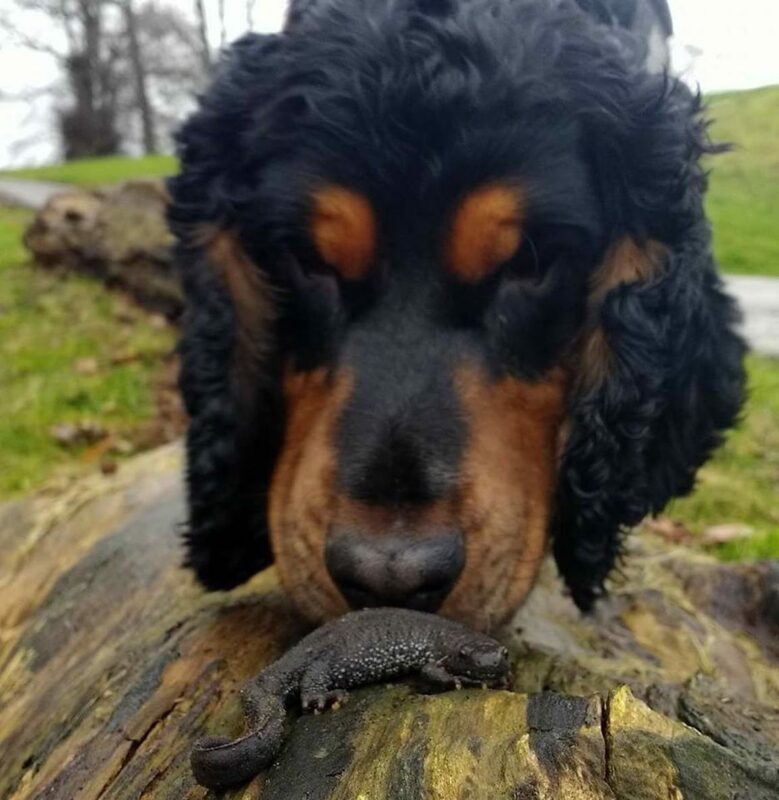 We have carried out discrimination training on palmate and smooth newts, as well as toads and frogs to ensure any indications given by the dog are for GCN’s only. All sites are different, but we do have a general methodology for searching for GCN’s. Wagtail also have dogs that detect Bat Carcass to assist with Wind Farm surveys. The dogs can search a vast amount of area in comparison to human search methods. The dogs are quicker, more accurate and more cost effective than human search methods. Additionally, we conduct ‘efficiency trials’ for our clients on each wind farm multiple times a year, which yield an extremely high rating. Wagtail UK are licensed by Natural Resources Wales to keep GCN in captivity for the purposes of training detection dogs. Wagtail is happy to present this license if requested. 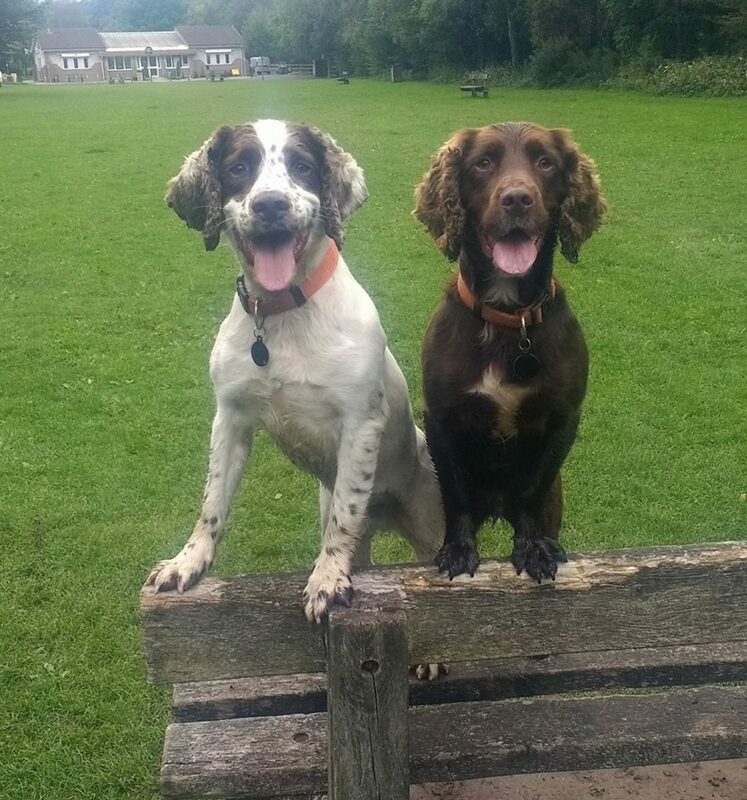 Working with ecologists and leaders in the construction industry, Wagtail have developed an assurance method to ensure our dogs teams operate to the optimum efficiency. Our dogs teams undergo an ‘Odour ID Test’ where a target scent is placed out that is ‘blind’ to the handler and the dog team has to correctly identify the target scent. The test will include a series of ‘runs’ that will also include the placement of distractor scents. The distractor scents will include items such as soil, leaves, palmate and smooth newts, frogs and rubber gloves (gloves are always used when placing out a scent). Our handlers hold CSCS construction site visitor cards and have 4×4 capable vehicles with chapter 8 livery. 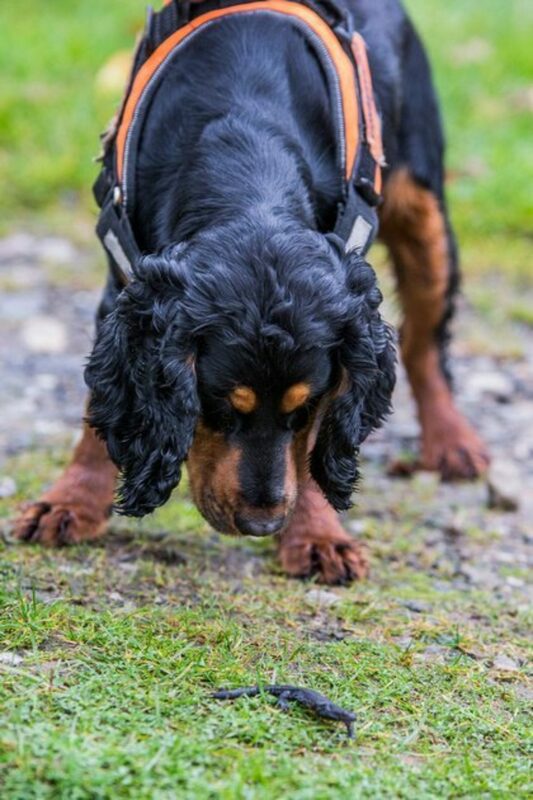 Wagtail can offer a free, no obligation presentation for interested companies organisations interested in the use of our Great Crested Newt Detection Dogs. If you are interested in learning more please do no hesitate to contact Aran Clyne or Sarah Levie.